Senate passes HB105, which would give trial access to sick Utahns. Francisco Kjolseth | The Salt Lake Tribune Catrina and Jeff Nelson alongside their daughter, Charlee, 6, who suffers from Late Infant Batten Disease, a terminal inherited disorder of the nervous system. 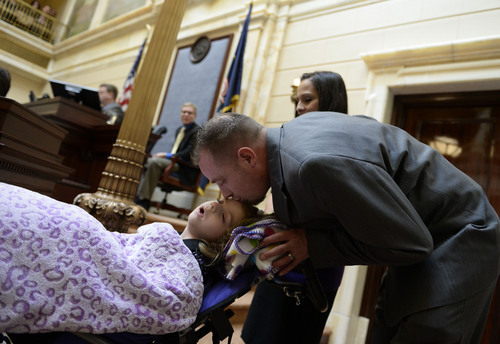 The family was acknowledged on the Senate floor at the Utah Capitol after senators unanimously passed HB105,which would provide access to cannabis oil for epileptic kids, on Tuesday, March 11, 2014. 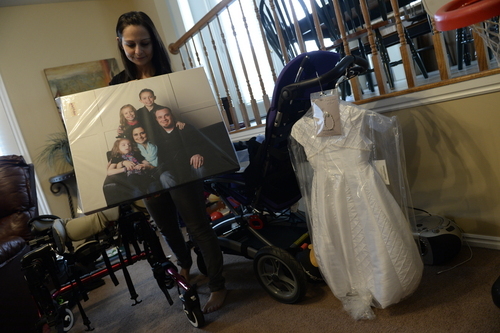 Francisco Kjolseth | The Salt Lake Tribune Catrina and Jeff Nelson alongside their daughter, Charlee, 6, who suffers from Late Infant Batten Disease, a terminal inherited disorder of the nervous system. 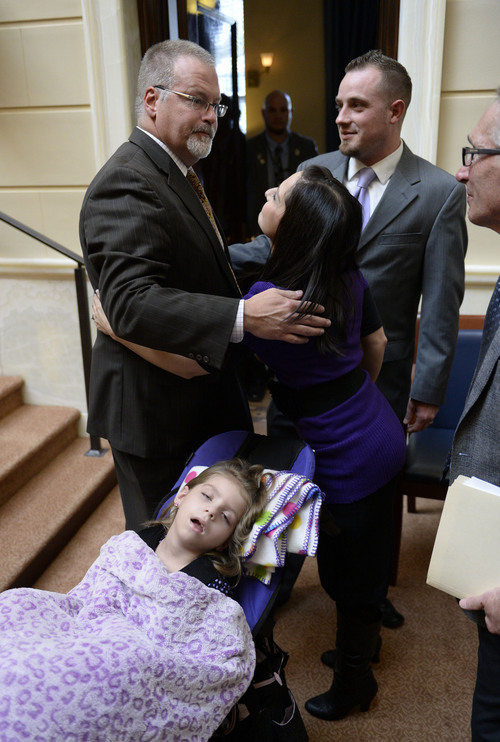 The family was acknowledged on the Senate floor at the Utah Capitol after senators unanimously passed HB105,which would provide access to cannabis oil for epileptic kids, on Tuesday, March 11, 2014. 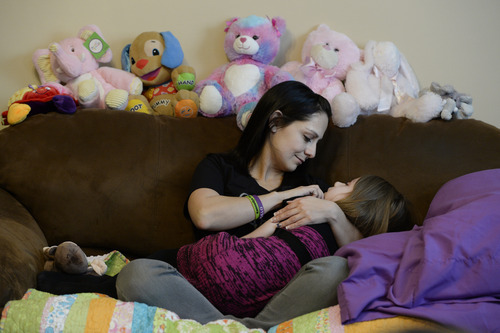 Francisco Kjolseth | The Salt Lake Tribune Catrina Nelson of West Jordan holds her youngest daughter Charlee, 6, who suffers from Late Infant Batten Disease, a terminal inherited disorder of the nervous system that leads to seizures, loss of vision and motor skills. Surrounded by friends and family, they stay close to Charlee, feeling her spirit at home during hospice care. Francisco Kjolseth | The Salt LakeTribune Sen. Stephen Urquhart, R-St, George, is embraced on Tuesday by Catrina and Jeff Nelson alongside their daughter, Charlee, 6, who suffers from Late Infant Batten Disease, a terminal inherited disorder of the nervous system. 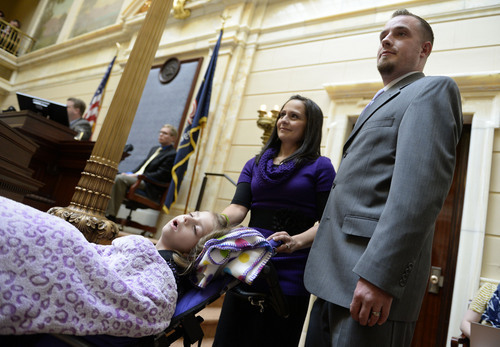 Charlee and her family were acknowledged on the Senate floor at the Utah Capitol after senators unanimously passed HB105, which would allow access to cannabis oil for epileptic kids. Though Charlee is near the end of her life and won't be able to benefit, the Nelsons say they find comfort in knowing some other children will. Francisco Kjolseth | The Salt Lake Tribune Catrina Nelson of West Jordan holds a recently made family portrait that was donated to her in honor of her youngest daughter Charlee, 6, who suffers from Late Infant Batten Disease, a terminal inherited disorder of the nervous system that leads to seizures and loss of vision and motor skills. At right is the dress they plan to bury her in when the time comes, which is expected to be soon. A bill that would allow compassionate use of nonintoxicating cannabis oil by Utahns with untreatable epilepsy passed the Senate Tuesday by a wide margin, despite reservations some senators have about the oil&apos;s safety and long term benefits. Senators applauded families seated in the gallery and they recognized Charlee Nelson of West Jordan, a 6-year-old who might have benefitted from cannabis oil, but is near death. Charlee and her parents, Catrina and Jeff Nelson, were invited onto the Senate floor. "This is Charlee. The bill will come too late for her," said co-sponsor, Sen. Stephen Urquhart, R-St. George. The House must consent to the changes to HB105 before sending the bill onto Gov. Gary Herbert for his signature. During the debate Tuesday, controls were added to prevent the oil from being abused and to protect families from unsafe products. The oil would have to be certified to contain at least 15 percent cannabidiol (CBD), the chemical believed to have anti-seizure properties, and less than 0.3 percent of tetrahydrocannabinol, or THC, the psychoactive chemical that gives marijuana users a high. "How do we determine quality control? Are there pesticides in it, herbicides in it? Are there bacterial contaminants? Are the CBD amounts at the proper level to actually do any good? Are there too high amounts of THC?" asked Sen. John Valentine, R-Orem, who pushed for the changes. "This bill has been a very difficult issue for me," he said. "I have people in my district who have the type of epilepsy that the hope is this extract will assist them … But it gave me pause for concern because I realized we were creating a hope, a hope that it does work." Nevertheless, HB105 was approved 20-0 following testimony by Republicans and Democrats who were moved by the plight of children who have exhausted all other remedies  including prescription drugs that cause brain damage and death. "These kids can&apos;t wait," said Sen. Lyle Hillyard, R-Logan. HB105 would give families trial access to the oil under the auspices of research. Only those with intractable epilepsy and written permission from a board-certified neurologist could apply to the Utah Department of Health for a waiver giving them permission to import cannabis oil. The bill would expire in two years, allowing lawmakers to test its results. It was also amended Tuesday to allow law enforcement officials who encounter "hemp waivers" to check their authenticity with the health department. In addition, neurologists would have to send their written permission to health officials electronically to avoid fraudulent recommendations. Sen. Evan Vickers, R-Cedar City, a pharmacist, said the latest version of the bill "is as good as we can possibly do. It does put some pressure on physicians and parents … it will be upon them to make sure patients get the right dose during the right time." Charlee Nelson has a rare disease that causes fatty cellular waste to build up in her brain, eyes and muscles, leading to seizures, mental impairment, blindness, loss of bodily control and eventually death. Cannabis oil isn&apos;t a cure. But it might have kept the brain-damaging seizures at bay, prolonging and improving Charlee&apos;s quality of life.